Part two of the holiday riding. Much later than it should have been but that's life! Skye has been quite kind to us on this holiday. Some glorious sunshine and little wind has made for a lovely visit. That's not to say that there hasn't been some bad weather. As I write this the rain is coming down out of clouds barely higher than the loch in the bay. That too has an upside; it keeps the midges away. There aren't too many roads on Skye so it is quite hard to get lost. It also makes it hard to find meaningful new routes. This ride, however, takes a very natural loop right from the main road outside our cottage. And it avoids all single track roads making for much easier piloting (as the next ride's description will attest to). It does, of course, maintain the non-flat persona for rides around here. This ride took place on a lovely sunny day with the promise of a south-east breeze to help us through the 2nd and 3rd quarters of the ride. It would mean riding the last 10 miles back into it, which isn't ideal, but was a better proposition than riding the last 10 miles with much up and down! So with that in mind we set off towards the Sligachan hotel. The start of this ride followed the first few miles of our route to Portnalong but didn't take the turning to Carbost. This time we stayed on the main road and headed down the glen towards the towering shape of Glamaig. This proved to be a very tough section. That SE breeze nagged away and slowed us down; we even had to pedal down the hill to the hotel at Sligachan. How undignified! And, as usual, what goes down on Skye must go up. The main road from the hotel leads north to Portree via a climb. Never particularly hard it isn't exactly a pushover either. However on this day we were blessed with the breeze behind us and we made short work (read - not much panting) of the hill. We then had a lovely, long descent towards Portree before the last mile or so of undulating road took us to the Aros Centre and their delightful cafe. This was the first of two planned coffee stops. 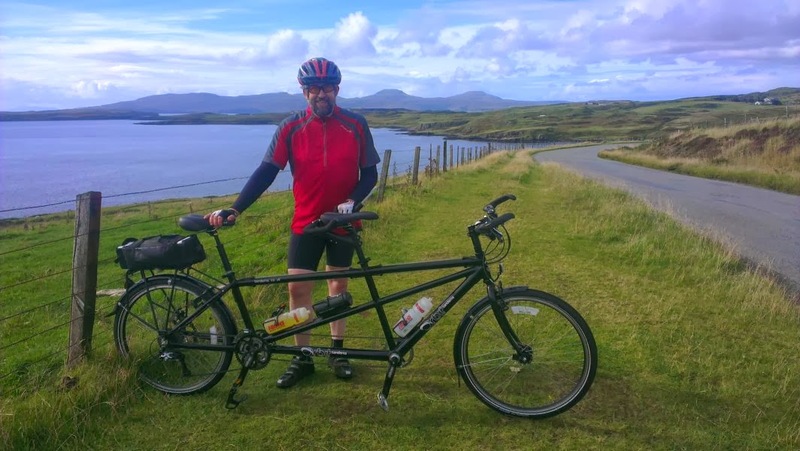 While we learn to ride together and given the nature of the terrain around Skye two stops in 55 miles seems ideal. We aren't fast and it is useful to get off the bike for a while. It all seems very decadent to me but this is companionable riding at it's most relaxing. With this blog in danger of descending into a review of cafes I can recommend this one too. A lovely mixture of food is available, all at a decent price. There were some people sitting outside (the weather must have been good) and the tandem was much admired as we went to set off. Luckily we didn't disgrace ourselves and got away cleanly on the next step of our journey. This time the cafe at Dunvegan Castle was our target. We were on a new piece of road for either of us in terms of cycling. Out of Portree on the main road to Uig. And it starts with a climb. I swear that all the natural routes on this island start with some going up. It just isn't fair. Luckily with cake and coffee (tea for the Stoker) fuelling us we made it up the steep section as we left Portree behind. Then we had the all important section of downhill. And what a lovely section this was too. It felt like it went on for a very long time indeed. Long enough that I found a new position for my hands which definitely help the aero nature of our riding in times such as this. Skye roads always get the last laugh however and soon it was time to work on going up again. The road rolls in big waves around to Edinbane where it ramps up one last time before Dunvegan. The word ramp doesn't do this hill justice. I'd cycled it before, training for the cross Scotland jaunt, and it nearly did for me that day. So on this fine day I was well prepared for it. We progressed smoothly up the first ramp and enjoyed the little bit of respite before the main event. According to Strava this hill is a lovely 1.7 miles long at an average gradient of 4.7%. Now, I know that isn't tough in the least for serious bike riders but for me and the Stoker it's hard enough. But because we knew it was coming we picked an easy to gear at the bottom and just got stuck into a rhythm, all the way to top. I was very, very impressed with the Stoker. Even more so on the way down the reward on the other side. Getting up to over 40mph near the bottom of the descent was reward for all our hard work. One more tiny little incline and I thought we would be cruising into Dunvegan. I should know better. The localised wind was blowing from the south and west requiring us to pedal our way to the village before giving us a little help up to the cafe. It was well worth the effort though with lovely coffee (tea for the stoker) and a scones. Yum! Then back onto the road for the flatter (slightly) road home. The wind wasn't helping on this section but we did well although I had an impression that the stoker's legs began to tire towards the end. I wasn't surprised as for us this was a combination of hills and miles that was pushing our boundaries a little. We enjoyed the downhill fast bits and suffered a little on hills but our cottage was soon reached. A lovely day out and a ride to be recommended. 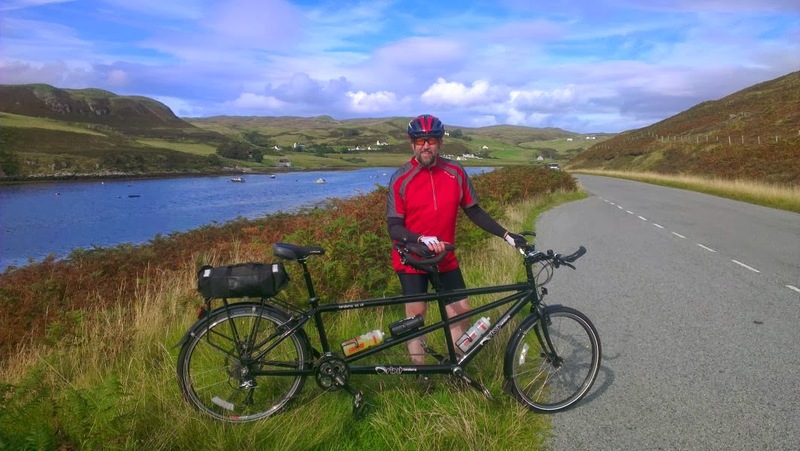 In a complete departure from the norm for us we decided to take the bike to Portree and ride from there. The forecast had looked good but when we got up there was low cloud (you have to go to Skye to appreciate how low it can get) and a little bit of drizzle around. Not much wind so that encouraged us to get going. This was much more traumatic than I would have liked. To put the bike on the car I had to strip some bits off, check the tyre pressures and sort the bike carrier out. All in the presence of Skye's greatest failing; the midge. Horrible tiny flying blood-suckers they are and by the time the bike was ready to go I was covered in fairly big lumps, one of which was right under my eye. Lovely. Time has taught me though that while I come up in great big lumps they tend to subside within 2 hours so I was confident that by the time we were cycling I'd be ok. Finally we were off and up through Portree we went. Only to stop again after half a mile or so to put the lights on which I'd forgotten to do in amongst the chat in the car park. Off again, and straight into one of Skye's many, many hills. I had been hoping for encouraging views of the Storr on this section but the low cloud was still present and we just concentrated on getting the job done. When we got to the inevitable downhill before the next rise I realised that I'd probably chosen my clothes incorrectly for the ride ahead. Shorts and the athletic-fit top were not the best but at least I had my arm warmers. I kept telling myself we'd just have to pedal hard and fast. This is harder when you're on a tandem, at least if you want still want to be talking to your partner at the end of the day, that is. After the Storr there's lots of ups and downs to keep the cyclist entertained. And all the more if you are on a tandem. We had more than we bargained for on the first descent. A big tour bus overtook us and then caused us to have to brake to slow down for it. Very, very annoying that; it killed our momentum. As we headed to Lealt we had another descent but unfortunately a much steeper climb out. And the idiot pilot got the gear changes on the chainring horribly wrong and off popped the chain! Luckily I got my foot unclipped before we did a double comedy dismount right beside a car park. A little fiddling about saw us on our way with my fingers now slightly oily. And all was well until just before Kilt Rock when one of the stays for the front mudguard lost its bolt and there was a horrible rattling. We found a parking space and I managed to improvise a fixing for it with a spare Garmin mount band. Incredibly useful they are. And again we were on our way but by this time I was beginning to feel that this ride was doomed and with the extra standing about I was definitely cold. We were only a short distance to our first stop though and the Columba 1400 centre proved a good place for me to warm up a bit. The coffee and cake were lovely and we met a nice couple who have been coming to Skye for even longer than we have. They told us that on their first visit they had walked from Portree to Staffin just to see the Quirang. It's a fair distance on a bike, goodness knows what it was like to walk. I had wondered if my Stoker felt the same as I did about the ride and would want to chuck it in and head back to Portree. But I kept it to myself and determined that I would go on if they voiced no concerns. So onward we went. The weather hadn't improved much and we were barely started before we had to stop again to switch the lights on. Doh! 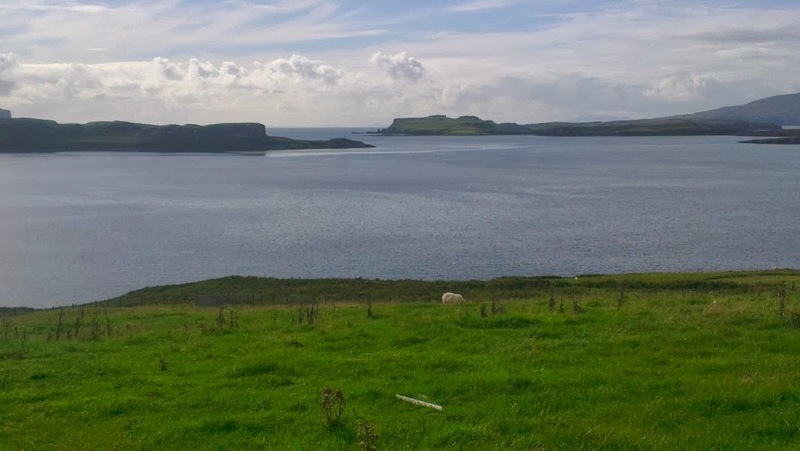 Then it was onward through Staffin and onto the single track road to take us around the northern end of the island to Uig. The more direct route to Uig is a steep climb past the Quirang which I have done but didn't think either the conditions or the Stoker were up for that. As we headed out of Staffin we got a wave from a couple sitting outside The Small and Cosy Teahouse which I have also heard good things about. The single track road added to the challenge of the ride, involving making room for Skye's suicidal sheep and the cars and vans that were also wanting to use the road. The weather also began to deteriorate causing me the need to remove my sunglasses. It was odd being able to see better without my glasses than with. It wasn't so much that it was raining more like we were riding in a cloud. It made the roads wet and I was very circumspect both on the tarmac and the numerous cattle grids we encountered. One benefit of the tandem on cattle grids is the bike's length. It means that you spend less time with both wheels on the grid which I felt gave more stability to the experience. As we came up to Duntulm the weather improved a little. The cloud rose and the road conditions became a little drier. Just in time for the big climb of the day. A long climb made up of several ramps with less steep parts in between. It was here that we survived some of the worst driving I've seen in a while. The climb had a good number of passing places on it and I was happy to use them to let vehicles past as long as we didn't have to stop. Around the middle of the climb we let a car make the most of such an opportunity and we started to move back into our usual position on the road. It was then that a white van decided to push past us as well which nearly ended up with us off the road. It took a lot of effort to keep us upright. I would have more sympathy with them if there hadn't been another passing place about 50 yards up the road. With hindsight maybe we could have been more accommodating but on these steep hills it's much easier if we can keep going. Still, we survived to tell the tale. The road then rolled along and we saw a couple of golden eagles flying above us which was superb. I suspect this stretch of the road would have beautiful views on a sunny day, all the way out to the outer Hebrides. All we could see was grey sea, grey clouds and damp scenery. 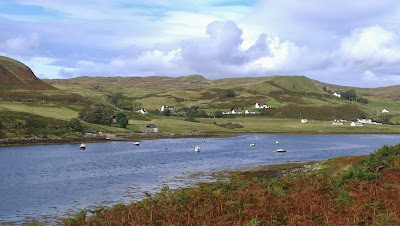 We climbed another long, but less steep hill and came out above Uig. From here the road is very steep and has a nasty hairpin in the middle of it. It was here that a voice came from behind me. "Oh, this hairpin!" I had reminded The Stoker before we left that we would have a hairpin to deal with on this ride but despite the number of times we have been on these roads they couldn't remember it. Until we were there that is. We negotiated the hairpin and a little back road which brought us right down to our next cafe stop. This stop was made at Ella's Cafe, another delightful place for food and drink. I had a hot chocolate and Ecclefechan tart while The Stoker had some tea and a chocolate brownie. Great fuel. While we were relaxing I could see that a gentleman with three small children (one very much asleep on his shoulder) were admiring the tandem propped up on the wall outside. When they came in he was keen to mention how nice it was to see. The two children were much impressed as well; with the bottle holders! Not interested in the fact it was a tandem at all. Very funny. We had cooled down a little as we sat enjoying our food and drink but we soon warmed up as we left Uig on another long climb. This climb isn't too steep but it does go on a bit. As we climbed the hill a car came up alongside us. It turned out to be French and the occupants gave us great encouragement before using their engine to pull away. The difference between the attitude of this car and the white van couldn't be further apart. We were now back on two way road and, after the hill, probably the flattest part of the day. I think we also had a little breeze behind us for this section so and when we were back on the flat we were able to pick up a little speed. Apart from the mile or so of road where there was no road surface. A long term project to resurface the A87 has started and this part of the road has the whole surface removed. This left a very lumpy, bumpy under-surface to ride on. The tandem and its riders all managed to come out at the other end without anything falling off. Quite an achievement given the rattling around. After that the road rolled along with long gentle ups and downs all the way to the brow of the hill above Portree. We then enjoyed the coasting and easy riding which took us into the town and back to the car. A great ride, somehow making the most of a pretty bad weather day. On the last day of our holiday we got another lovely day and we decided to take the tandem out for one more ride. This time we though we would go from the cottages and not engage in the faff of carrying it on the car again. Thankfully I managed to get it all set up with bags etc without getting too many midge bites. We didn't want to repeat our central loop ride so we needed to find something else to occupy us. There wasn't another obvious loop of the length we would have like so we went for a there and back route to Trumpan. This meant riding back up towards Dunvegan but as we had done all the little loops off this road the first time we had a new experience just riding the main road. It did mean that we had to ride all of the steep slope about halfway to Dunvegan where we had sneaked off the time before. But we made it and the turn off to the Dunvegan bypass came soon enough. While we have driven this stretch of road I remembered it as flat. It isn't! It makes steady progress uphill towards the main road. Never steep we had no difficulty with the slope; it just seemed to go on. The sheep on both sides of the road provided the entertainment. I'm sure they play with vehicles and cyclists alike. Just for the fun of it they run from side to side with no discernible pattern or reason. We managed to get to the junction without running any of them down or coming to grief ourselves. We had a little more uphill to go before a slight downhill to the turn off for Trumpan and the Fairy Bridge. A good place for a stop and a look at the map on the Tourist Information sign. It showed a road going up the peninsula with a little loop at the end of it. This was our road. And what a lovely stretch of tarmac it was too. Apart from one little steep incline near Skye Skyns it was probably the flattest piece of road we met the entire holiday. Having waited on the loop for a stationary car picking up a passenger we proceeded to the church and car park at the head of the loop. Then I saw a tractor at the top of the rise. Luckily they saw us and let us come up. We got there and suddenly (to my way of thinking) the Stoker stopped pedalling. We came to a stop and had a "discussion". Of course, all things less than perfect on a tandem are the pilot's fault and this was no different. I had said as we came up the east side of the loop that the road went no further than the church and my compatriot had assumed we would be stopping and turning round. I had planned to go round the loop. Hence the confusion. All my fault. Maybe we should have turned around, and I might recommend that course of action if you find yourself there, because once we headed off we found the sting in the loop. Firstly the road surface deteriorates considerably and drops alarmingly before turning a sharp corner to reveal a nasty little climb on a bit of road that has grass in the middle and gravel on the other bits. Fun. We ground it out in a higher gear than I would like to stop wheel spin and soon enough we were at the top. The road surface improved and we retraced our steps to the Fairy Bridge enjoying the views over the bay and looking down to the Stein Inn. We didn't visit it on this occasion but I have spent a very pleasant night in there before drinking a little whisky and enjoying the chat. Worth a visit if you are in the area. Back at the Fairy Bridge we decided we were good to keep going to the cafe at Dunvegan for refreshments. A little effort brought us to the top of the long slope into the village and we enjoyed getting the tandem up to speed. We had to work against the breeze here until we were on the little road up to the cafe. We were also racing against a rather nasty black cloud dropping rain on the MacLeod Tables. We didn't want to get wet! The refreshments were well worth the extra exertion. Not that we mind a bit of speed. Once we were suitably fed and watered it was time to head back. As we came out of Dunvegan we had wet tarmac under our tyres. So the stop was well-timed and we followed the cloud south as we cycled back to the cottages. It had only just grazed our route and the roads turned dry again and the sun came out in time for our arrival in Struan. We didn't really want to stop so we decided to cycle round the bay and head up to the well used view point for some photos of our own. Once they were done we headed back to a lower car park where we took a few more pictures for our scrap book. Then we had to head back and start the job of packing up. It's always sad to end our trips on Skye, but this time it was especially hard as we had had such a lovely time travelling the roads. Here's to coming back. It won't be long!